In case you haven’t heard, we’re moving! But before we do, we’re closing out our time on Charles Street with a bold and funny production created by the Carrots, in a way only Carrots can. For more info on our move, CLICK HERE. Join us for our FINAL SHOW on Charles Street! A high-octane laugh explosion from the company that brought you Slampooned! and Sects and Violins. PLUS Special late-night performances on Fridays and Saturdays! After plotting and planning for years, Single Carrot Theatre is bringing the next great sketch show to Baltimore. We’re taking inspiration from the boiling-hot writers’ rooms of classic comedy shows and crashing that energy into the spectacle that makes Single Carrot Theatre a prime spot for theatrical innovation. GET YOUR TICKETS FOR TONIGHT’S SHOW NOW! 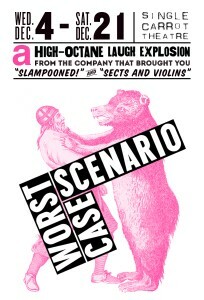 Worst Case Scenario is a sketch comedy show written by Single Carrot Theatre, in the style of Saturday Night Live. It runs about 75 minutes long with no intermission. On Charles Street and Lafayette one block south of North Ave.